I owe my lymphedema an apology. Over the past 60 days I have put it through the wringer. I’ve done just about everything we are told not to do as lymphedema sufferers. Work 12 hour days, 7 days a week? Check. Subsist on pizza, coffee and Halloween candy? You bet. Exercise? Nope. Meditate? Nah-uh. Wrap? Not a chance. Why did I put my lymphedema though this abuse? My chosen profession is politics, which means that every September and October is a test of endurance. The last two months before election day are a sprint with much at stake. This year, the future of the county in which I live (as well as my own immediate financial well being) hung in the balance. Everybody needs help getting back on the Yellow Brick Road. After times of stress, try to surround yourself with people who will help you heal. Thankfully, this time we came out on top. My boss handily won re-election, and I still have a job. My lymphedema, on the other hand, came in dead last. My body had been so neglected that my lymphatic fluid felt more like lymphatic solid. 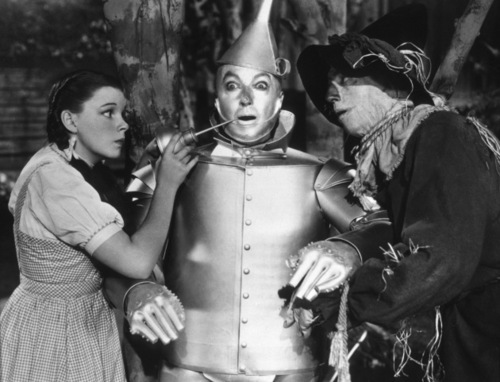 I was so stiff, I made the Tin Man seem like Stretch Armstrong. Subsequently, my immune system surrendered to a cold that had been lying in wait for weeks. Getting my body moving and whole again would take more than an oil can.